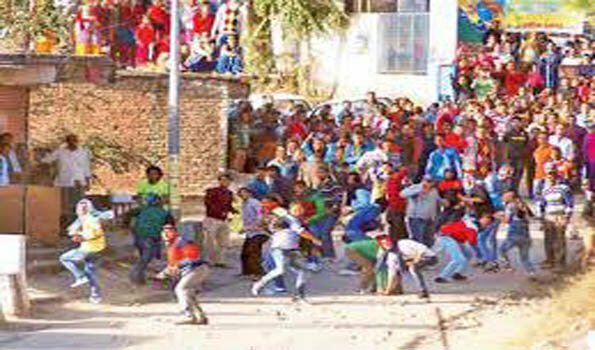 Shimla: Strange......Diwali is followed by stone pelting in a Himachal village.Just 26 km away from state capital Shimla, a small village Dhami follows a century age-old tradition, where on the very next day of Diwali, two clans of the village pelt stones relentlessly on each other. In the stone pelting, the first person to receive the ''blood oozing injury'', is considered ''Bravo'' (brave) among all.The injured smear 'tilak' on the forehead of the idol of Goddess Kali with the blood. They believe, the ritual is necessary to appease local deity.On Thursday, during the ritual, there was no major casualty, police said. The event, quite popular in the hamlet, witnessed participation from hundreds of youths. Suraj, 28-yr-old native of the village, was chosen to smear 'tilak'. He, along with others sustained stone injury and provided first aid, police said.However, there was no major casualty, police said.